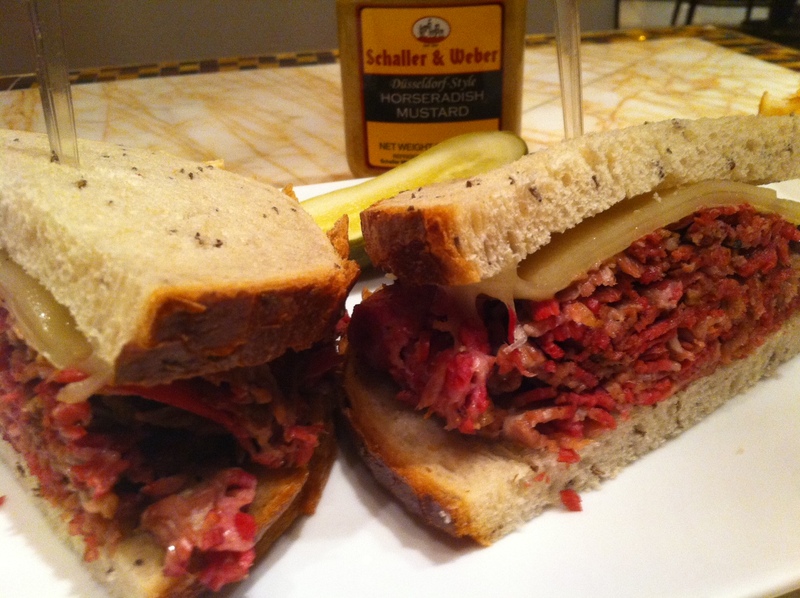 To the short list of spectacular pastrami sandwiches on the Vegas Strip, add this beauty from the underrated Zoozacrackers deli at Wynn. Give it a few extra points because unlike the offerings at imported joints like Canter's and Carnegie, the Zooza crew makes all this stuff in-house: pastrami, corned beef, even the latkes. And it's very steady. This simple, sublime sandwich comes on some pretty great bread, also baked in the resort. It's soft but firm seedy rye with just enough flavor. The pastrami is very different from those other places, and from what you're used to eating with store-bought meat. It's incredibly tender with zero bites of weird fattiness or gristle, thanks to a very complicated and lengthy cooking process. All the familiar tastes are there, including a subtle smokiness, black pepper, garlic and coriander. It's not overly salty. The flavors are round and smooth, beefier than other pastramis. Great stuff. They tack on some Swiss cheese and let you go at it yourself with the mustard. Scrumptious bites like these make us continue to hit the Strip for our regular deli fix. It's hard to say this is better than the rest, as it's so different. But for now, there's not another place anywhere in Vegas I'd rather get a pastrami sandwich.